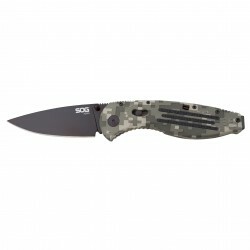 "SOG's comprehensive Aegis line of premier folders is fully integrated with top end systems. Start to open the knife and let Aegis finish the action with a bang using one of the surest assisted technologies (S.A.T.) out there! The trademark bayonet reversible clip built in safety with red/ready to go and checkered DigiGrip handles all contribute to make Aegis a platform for today's changing world. Cover your back with Aegis outdoor or tactical blades.